We often talk about bellydance as being complete exercise in its own right, and in many ways it can be. Depending on your style and how you train, bellydance can provide you with cardio, core strength, flexibility and endurance. Most higher level dancers however, supplement their dance training with other kinds of fitness training, for a number of reasons and it is likely that at some point (as I reported back here) you will feel like branching out a little. 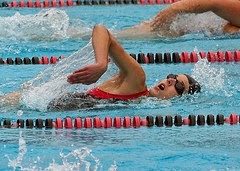 Improving your cardiovascular fitness and stamina is generally helpful for any physical activity. The ability to dance an energetic 20 minute set without becoming noticably out of breath or sweaty is a useful part of the professional dancer's toolkit. Just practising your dance all out is helpful; but it is always worth training at a higher intensity than you would perform, so performance feels effortless. Drilling your basic movements will help with range of movement, muscle strength and control, but you can support this process and improve your dance skills with targeted conditioning. There are also some advanced moves that are difficult or dangerous to attempt without a prerequisite of fitness that goes beyond the norm. For example level changes, backbends and turkish drops all require strength and flexibility at the outset and attempting the move without it can lead to bad form and injury. Keeping a balance in your fitness is also important. If you are dancing a lot then you can end up with muscle development geared towards dance. That's not always a bad thing, but it is really important to be mindful of your body's alignment and balance. Releasing that tight psoas muscle, making sure that both sides of the body are equally strong (very important for ATS dancers) and supporting good posture will improve your health as a whole. There is a huge range of fitness training that can be beneficial for bellydancers. Within reason it is worth considering what you enjoy and go for that, however it is important to consider your ongoing health and avoiding injury. There was a time when I trained WTF Tae Kwon Do, but full contact martial arts means lots of broken feet, which isn't something I can risk as a dancer. Here are some examples of cross training that is common amongst bellydancers. Let's blame Rachel Brice for this one, although I'm not sure she was the first bellydancer to train this way, Rachel's background as a yoga teacher coupled with her impressive strength and flexibility and her extensive influence in the Tribal Fusion community (and beyond) has made yoga a popular choice for bellydancers. Vinyasa flow yoga, an offshoot of Ashtanga that primarily consists of sequences based on an expanded sun salutation, is popular among dancers and great for core strength, alignment and good posture. Restorative yoga is also blissful for those times when you have trained a little too intensively and need to take care of yourself. Pilates is also great for dancers and there are a lot of bellydance specific pilates workouts available by bellydancers who also happen to be pilates teachers. A pilates workout can be fairly gentle or very intense. It might involve weights and I really like it when it involves things like fitness balls for really good core conditioning. As with yoga there is a strong focus on alignment and good form to get the most out of the exercises whilst minimising the risk of injury. With pilates you can focus very strongly on areas that you need for dance, like legs or abs, or go for a whole body workout. Another great option for a whole body workout that doesn't put too much strain on the body. The lack of load bearing is gentle on the joints and can be helpful for dancers who are rehabilitating from injuries. It is also a great way to get your upper body working. I do very much enjoy lifting things. There is something immensely satisfying about lifting dumbells, and it is easy to slip a few reps in for 5 or 10 minutes now and again. 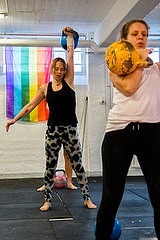 If you like to train in company, you could try a kettlebells class. The upper body is often neglected, but it's important to remember that grace and fluidity in your arm movements will come through strength. Weight training can also be great for core conditioning and posture. Cardio is really important, but it's up to you how you do it. If you are sweaty and breathless you are getting there. Some dancers run regularly, some go to the gym, some do classes. I love a good intense 20 minute shimmy drill to combine cardio, stamina and technique. For a convenient and no nonsense way to combine cardio, strength, endurance and plyometrics, circuits can be a good option. If you don't really enjoy working out, the exercises happen in short bursts and change often, so you don't get too bored. Mixing up the exercises means you get to work on different muscles and you are not putting too much strain on particular areas for too long. Some circuit exercises can be tough on the joints, but there are usually modifications or alternatives which a good trainer or class facilitator can help you with. So there you have it. See what you fancy and give it a try. Keep listening to your body and going back to your dance practice, see what makes the difference for you. It is immensely satisfying to see the results of your hard work manifesting in the quality of your dance!